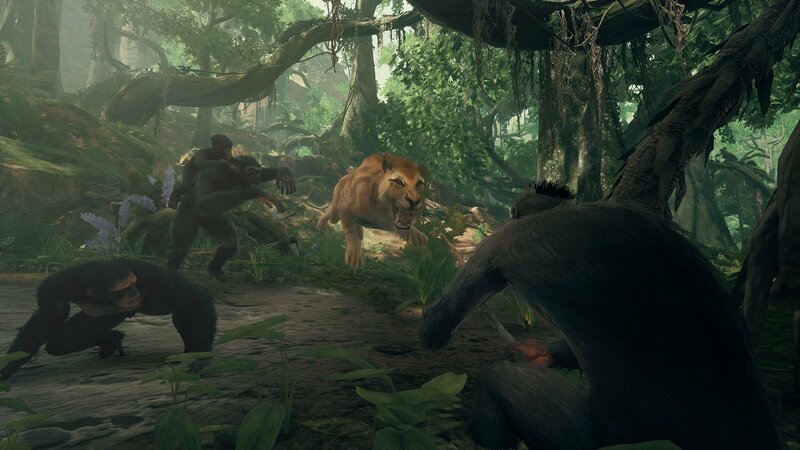 Shacknews gets our first hands-on with Ancestors: The Humankind Odyssey and discovers the origin of species. The story of humanity is much like one of the old Jurassic Park taglines: Life finds a way. Through overcoming nature's greatest adversities, man has persevered and prospered throughout the ages. It wasn't always this way. Millions of years ago, man's ape ancestors had to survive through learning, adapting, and avoiding some of the African continents greatest dangers. 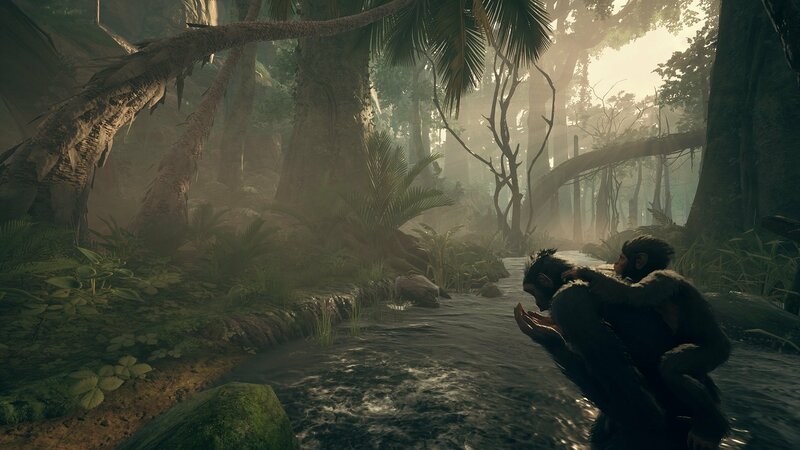 Survival is the name of the game in Ancestors: The Humankind Odyssey, the first outing from Assassin's Creed creator Patrice Desilets' new Panache Digital Games. Four years in the making, there is no strict narrative or overarching story. Rather, the story is in the development of the human species, from 10 million years ago up to 2 million years ago. Shacknews stepped into the dawn of humanity and went hands-on with this deep dive into the origin of species. Ancestors sets its tone early, introducing players to the African supercontinent. It's filled with dangerous creatures, like prehistoric gaters, deadly snakes, and fearsome saber-toothed cats. The birds are no picnic, either, as evidenced by the game's opening cutscenes. Players are witness to a vicious bird picking up a hominid and his baby and stabbing the father through the chest with its sharp beak. Players soon take control of another adult hominid, where the opening message, "Good luck, we won't help you much," quickly proves true. While players can set up tutorial messages to pop up throughout their playthrough, little direction is provided in terms of which way to go. Hominids must rely on their instincts, leading into Ancestors' two main mechanics: Senses and Intelligence. Senses allow players to listen for items of interest. For the game's opening minutes, players listen for the abandoned hominid baby. Over the course of our playthrough, we used senses to pick up on the sounds of hostile animals, like warthogs and snakes. The opening minutes are truly a trial by fire, as I quickly learned to uses Senses to my advantage. Moments are taking control of an adult hominid, I walked right into a mamba, which left me debilitated for a solid day. Intelligence is where players can pinpoint various items of interest throughout their field of vision. Many of the items they pick out are ones they've already discovered, ranging from plants, to food, to wild animals. Players cannot identify items they haven't encountered. In order to do that, homonids identify items the old-fashioned way. They pick them up and sniff them. This leads to the discovery of food, tools, and supplies. Intelligence becomes a key component in getting around the wide open continent, as players can permanently mark select items as a waypoint using the Memory mechanic. With Ancestors' primary goal being to survive, evolve, and thrive, the true game opens up after encountering your clan of hominids. At this point, players can switch back and forth between different clan members, with skills varying across each hominid. Players can explore with a male in his prime, a more experienced elder, a mother carrying children, and more. Selecting which homonid to use depends on how the player wants to progress. For example, carrying children might be a risk to your clan, since encountering danger means potentially risking the future generation. However, homonid senses will develop faster when carrying children, so there's that benefit to consider. As hominids learn skills in the field, they'll further develop those skills in their sleep. As players prepare to sleep for the night, they have the option to develop their homonid skills via the neuron system. This is a skill tree that discovers new skills and builds on already-developed skills to help spur on evolution. For example, players can develop their motor skills to ultimately learn to use two hands. These are all incredibly basic skills, but remember, these are basic creatures. This eventually leads to more nuanced skills, such as parlaying newfound ambidexterity into developing tools. It didn't take long for me to learn to use a rock to smash open a coconut, which presumably opens the door to learn skills like fire in the future. Given Patrice Desilets' background with the Prince of Persia and Assassin's Creed games, one would expect verticality to be a major element of Ancestors. That is indeed the case, as homonids can climb trees, reach new heights, and jump from tree to tree. However, traversal in the prehistoric era can have its drawbacks. It can be easy to misjudge a leap and miss your target entirely, leading to a great fall to the ground. Bones break quite frequently in Ancestors and if you completely eat it trying to jump from a tree, your homonid's movement becomes restricted. That can be dangerous if there's a good distance to the home settlement, so be wary when making your leaps. There was a point where I was on a broken leg and was quickly surrounded by a snake and a warthog. Slowly climbing the nearest tree, I was able to use an Intimidate function to send them scurrying away. That didn't quite work so much on a saber-toothed cat. Evolution is a slow process and so too is Ancestors. Desilets estimates that the game will run about 50 hours, depending on the player. Beyond the initial challenge of helping the species thrive, advanced players can eventually open up a separate Survival Mode, which will drop players in a random spot on the African continent. To further add to the challenge, players can turn off the HUD and tutorial notes entirely and just follow their instincts. 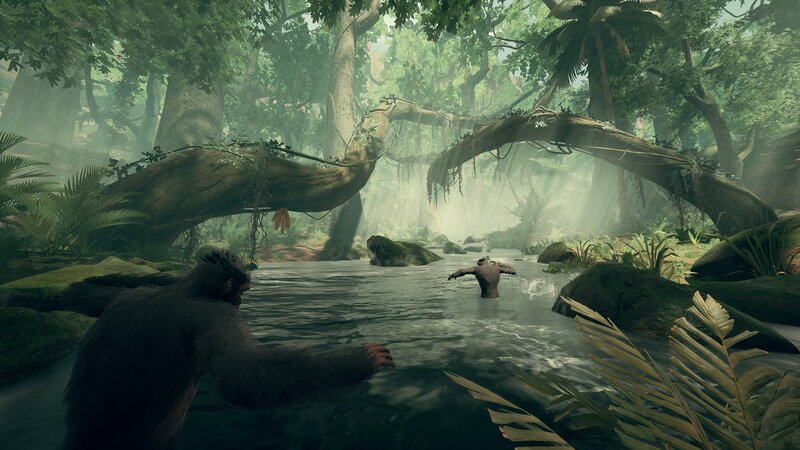 There's a full prehistoric world to explore in Ancestors: The Humankind Odyssey. It is coming to PC, PlayStation 4, and Xbox One later in 2019, where it will start at a $39.99 price point.